Includes: full color, spiral-bound workbook. Couples and their midwives will adore this book and this class. Topics include the nuts and bolts of the various stages of labor, positions for labor and pushing, as well as the variations of labor. Information on water birth, emergency childbirth, and advice from midwives and couples who have birthed their babies at home or birth centers makes this a valuable one-stop workbook. Includes: 40-page full color, spiral-bound workbook. I also offer a Refresher Course. It is a 3 hour class designed for women who have already taken Birth Boot Camp during a previous pregnancy, or have already experienced a natural birth. Contact me for more details. If you are wanting to focus on optimal health for you and your baby as you prepare for childbirth, this is the class for you. Our Food and Fitness module covers everything from your mental and emotional health, to the foods you should eat. Don't fret. Don't fear. Just take our Food & Fitness class! Includes: 50-page full color spiral-bound workbook. This workshop is designed to help both partners build confidence for the big day. You’ll take in lots of relaxation, comfort measures, massage, imagery for labor, as well as communication skills for labor. This workshop does not replace a childbirth education course. The beautiful workbook that comes with this workshop is one you’ll want to spend time with for the duration of the pregnancy. Class time 3-4 hours. Topics include breastfeeding (3.5 hour video course included), newborn procedures; babywearing, safe sleep, postpartum topics, and baby comfort techniques, as well as advice from veteran parents! 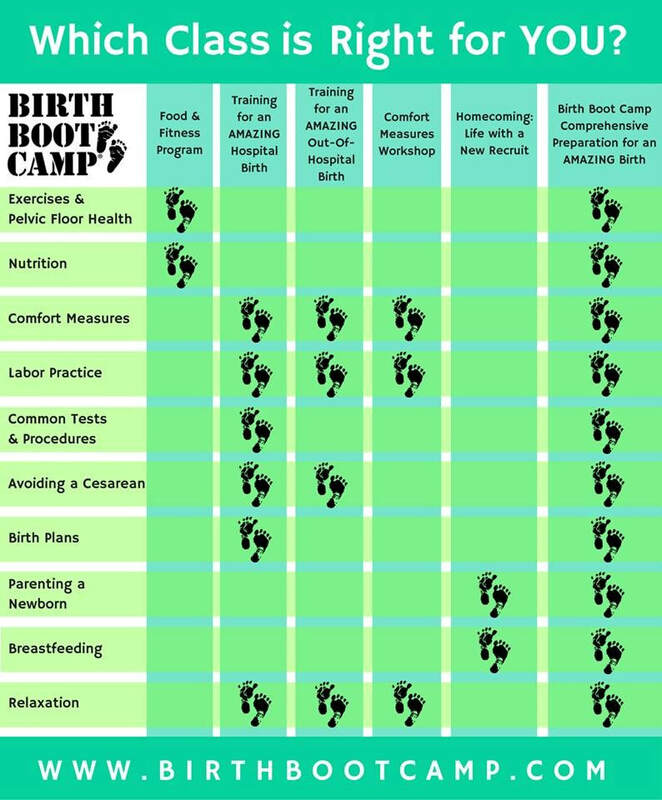 What is fantastic about Birth Boot Camp is that you can take classes online, in your home, anywhere in the world. You will receive the same materials that are taught in live classes without having to leave home.